Rafael Kubelík doesn’t have the reputation he deserves. The reason may be that, as a Czech conductor, we expect him to excel in Smetana and Dvořák. His recordings of those composers are undoubtedly fine, but when compared with other Czech conductors of the mid-20th century—Neumann, Talich—he is found wanting. In fact, Kubelík’s greatest strength was his distinctive approach to the core Austro-German repertoire, marrying a keen sense of architecture with a lyrical freedom of expression. These Brahms symphonies with the Vienna Philharmonic are a case in point, and so their return to the catalog, apparently for the first time on CD is most welcome. At the time of these recordings, in the late 1950s, Kubelík was effectively an itinerant conductor, though was coming to the end of a short tenure at the Royal Opera in London, where he was hounded out by Thomas Beecham, who believed foreign artists should not be engaged there. Fortunately, his genius was widely recognized, and he was in high demand elsewhere. 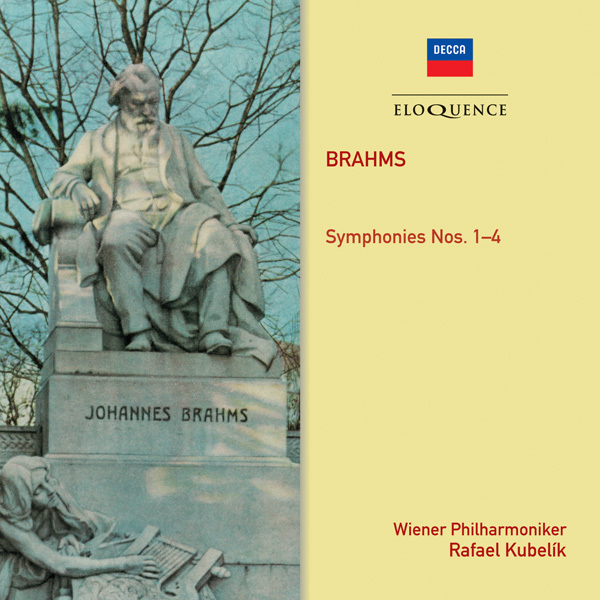 Kubelík would later return to the Brahms symphonies, in a period of greater professional stability, recording them with the Bavarian Radio Symphony in 1983 (that version now available on Orfeo), then more than 20 years into a close relationship with that orchestra. Interpretation-wise, the two cycles are similar, both demonstrating Kubelík’s hands-on approach, while still allowing the music to flow. His respective relationships with the two orchestras distinguish the cycles. By 1983, the Bavarian RSO was finely atuned to Kubelík’s approach, giving a sense interpretive unity to all four symphonies. The Vienna Philharmonic, of course, hardly needs a conductor at all in this music, and Kubelík can often be felt to hold back with his interventions. The woodwind soloists are given greater freedom, and the few ornaments in the melodic lines are presented in a surprisingly flamboyant manner, presumably just the way this music is played in Vienna. Kubelík’s tempos tend to be on the steady side, although every movement bar one (Symphony No. 4, movement 2) times out faster here than in Munich. The third movement of the Fourth Symphony is particularly patient and deliberate, while the third movement of the First eventually reaches a scherzo pace, but only after Kubelík gradually approaches the tempo from a similarly steady opening. Kubelík’s tempo interventions are usually subtle, for instance the first movement of the Second Symphony flows elegantly through the exposition, only becoming slightly more angular in the drama of the development. The first movement of the Third Symphony gets more intervention from the podium, with some intrusive tempo changes in the transitions. Only the Third Symphony is played with the first movement exposition repeat, though the first movement repeats are observed in the First and Second Symphonies in the BRSO cycle. The recordings were made in Vienna’s Sofiensaal between 1956 and 1957, in other words just before the same orchestra recorded Solti’s Ring cycle there (and, indeed, John Culshaw is among the recording producers listed). The greater attention afforded to those Solti recordings by remastering engineers may be the reason for the difference in sound quality, but Kubelík’s Brahms doesn’t come close. Generally, the sound feels top heavy for a lack of weight in the bass, so the woodwind-dominated opening of the First Symphony comes off much better than the cello and bass oriented opening of the Third. On the other hand, the recordings are in stereo, a rare bonus in that era. The stereo separation is not too exaggerated, although the left and right positioning of the first and second violins is clearly apparent. The Bavarian RSO version remains the Kubelík Brahms of choice, not least for the audio—the comparison is very much one of “modern” vs. “historical” sound, but this set makes a fascinating complement. Eloquence squeeze the four symphonies on to two well-filled discs, the first over 80 minutes, and include an excellent booklet note on the history of the recordings by Rob Cowan, Kubelík’s most eloquent and enthusiastic advocate of recent times.